Our professionally trained dental hygienists do not simply clean your teeth. One of the first objectives of a dental prophylaxis is to remove all the tartar from the teeth.Tartar is a hard, yellowish deposit on teeth. It is composed of mineral salts, food, and other debris that has hardened over time. Tartar cannot be brushed off. It has a rough surface, attracting more debris and food particles, causing a repeating cycle of tartar formation and buildup. Our office is equipped with state-of-the-art ultrasonics scalers which permit the removal of tartar in a gentle and atraumatic way. A dental obturation may be defined as the removal of decay or of a defective filling and a replacement of tooth structure by a biocompatible material. 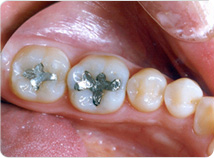 Amalgam or silver fillings are very rarely used in our office. We prefer to use composite (white fillings). Composite has the advantage of being able to be bonded to the tooth and therefore has less chances of falling out. Advances in dental materials have brought about new dental composites which last much longer than those of the past. A crown or what some people call a “cap” is made of porcelain fused to metal or only of porcelain and is placed onto a tooth to restore or strengthen it. The tooth is reduced in size and an impression is taken and sent to the laboratory. A dental technician will fabricate the prosthesis according to the prescription given by the dentist. WHAT IS A ZIRCONIA CROWN? This type of crown is made from zirconia, a very strong material which is compatible with the human body. Zirconia is used in many other medical applications such as artificial joints and is known for its strength and durability. Zirconia is a type of crystal which is long lasting and indestructible. Plus there is no fear about the body rejecting zirconia or displaying an allergic reaction to it. It is safe to use and preferred by many people to porcelain fused to metal crowns. Aesthetics : these crowns have an attractive translucent colour which blends in well with the other teeth. So Zirconia is, a great choice if you are looking for a strong, long lasting and visually appealing crown. They are ideal at covering signs of damage or staining as well as helping to maintain the function of the tooth. A bridge, otherwise known as a fixed partial denture, is a prosthesis used to replace missing teeth and is not removable by the patient. A prosthesis that is removable by the patient is called a removable partial denture.A dental bridge is fabricated by reducing the teeth on either side of the missing tooth or teeth than taking an impression (these teeth will serve as the pillars of the bridge and are called abutments) to send to the dental laboratory (just like for a crown). The missing tooth or teeth will be replaced by porcelain teeth and called a Pontic(s). Just as for a crown the bridge will be cemented permanently into place and is not removable. A root canal is needed when the pulp of the tooth (nerve) is sick. This happens when the tooth has been traumatized or when dental decay has reached deep within the tooth. The objective of a root canal is to remove the inflamed (or abscessed) pulpal tissue and to replace it with a biocompatible paste. Although the tooth can be considered to be dead (no more feeling of hot and cold) it’s periodontal (gum) attachment remains healthy so you can still feel normal pressure on it when biting down. A tooth which has had a root canal will however tend to darken and becomes dry and brittle and can fracture. This is why all teeth which have been subjected to a root canal require a crown. A removable denture is a dental prosthesis made to replace a few (partial denture) or all (complete denture) teeth in a given arch. We make all types of removable dentures: cosmetic, acrylic, metal, claspless, implant retained, partials, immediate (healing) and regular dentures. Typically people have a much harder time getting used to a removable denture in the lower arch (bottom denture). Whereas the upper denture covers the palate to give it suction, the lower denture is trimmed in a horseshoe shape and has the constant presence of the tongue to deal with. Studies have shown that the lower denture can move up to 1 cm in all directions when chewing food. This is why so many people with lower dentures have problems wearing them. Fortunately today there exists a procedure which can permanently stabilize dentures by allowing them to snap into place. View our section on dental implants and mini implants to read more on this wonderful new procedure. Periodontal or gum treatment is needed when the tissues surrounding and supporting the teeth are affected. Gingivitis is usually the beginning sign of gum disease. 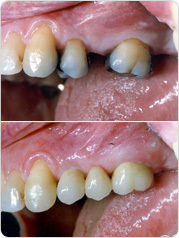 Left untreated, gingivitis can progress to periodontitis and is the leading reason for tooth loss in adults. Common signs of periodontitis are bleeding gums and bad breath. However many times gum disease goes unnoticed and the longer you wait to receive treatment the worse the gums become. Eventually teeth can become loose and are prone to abscess: it’s then too late to save them. In its early stages we may treat gum disease by what we call a curetage. This is basically a deep cleaning where we may numb up the concerned teeth so that we may clean them below the gum line. If the disease has progressed too much for a curetage, surgery may be needed and we may refer you to a gum specialist called a periodontist. Orthodontics deals with occlusion (the way your teeth bite together) and tooth alignment. Commonly referred to as braces, orthodontics no longer requires to have the metal mouth look of yesteryear. In fact some techniques require no braces at all such as Invisalign. While most people associate braces to teenagers, the truth is you can straighten your teeth with braces at any time whether you be 10 or 80 years old.